I clearly remember the day I had to explain to my not-quite three-year-old daughter why I couldn’t pause the episode of Dora she was watching while she went to use the potty. We were on a week-long vacation and she’d never known a world without a TiVo DVR, a world where I couldn’t pause live TV or easily record programs with the press of one button. Flash forward seven years and we no longer use a DVR, from TiVo or our TV service provider. We live in the world of the Smart TV, using apps to get TV shows and movies off the Internet from Netflix and Amazon, or using the on-demand service from our TV service provider. TiVo has also moved with the times, providing access to Internet content for its DVRs. And now it’s getting into the Smart TV business with two models from Best Buy, a 32- and 42-inch Insignia Connected TV for $499 and $699 respectively. To be clear, there is no DVR in the Insignia Connected TVs. 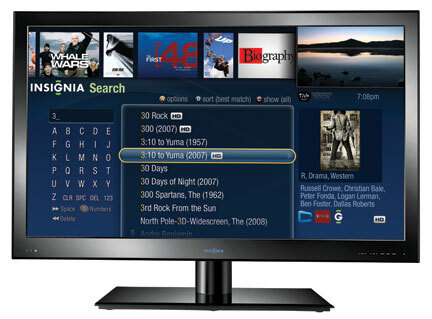 Best Buy partnered with TiVo for its software, which makes it easy to search for and find Internet-based content. At launch you’ll find apps from Netflix, CinemaNow, YouTube, Pandora and Napster, plus popular entertainment and social media applications from the chumby content network, including Twitter, Facebook, Photobucket, Accuweather, Reuters News and Sports, Stocks and Traffic. And you can go to the chumby website to browse the hundreds of other apps available and download them to your TV. You’ll pay about $100 extra for the Insignia Connected TV models. The LED-backed LCD TVs are both 1080p sets running at 120Hz, have four HDMI inputs and built-in Wi-Fi. They are also compatible with Best Buy’s wireless audio technology, Rocketboost, which makes it easy to add a soundbar or rear-channel surround sound speakers. In all, a good job for a first generation product, but there’s room for improvement. First, video search is limited to CinemaNow and YouTube listings. For Netflix content you have to go into the Netflix app (Best Buy says that will be fixed soon). There’s no keyboard option, either on the remote or as part of a smartphone app. You can’t search listings from your TV service provider or any TiVo DVRs in your home. And there’s no IR blaster output, so you won’t be able to switch channels on your TV service provider’s settop box, if local listings become available.